Well, the installation of Act React is finished. The exhibition opens this week. 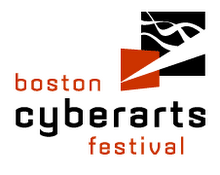 There are two nights of openings and a panel discussion with all the artists this Friday. The exhibit opens to the public on Saturday, October 4th. I'm very pleased with exhibit and excited about it. Already there seems to be considerable buzz. Here are some picture I took of the installation. 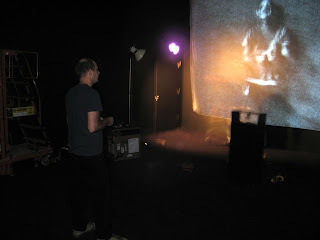 Here is Brian Knep working on the his projectors. Brian’s Healing Pool is a world premiere. It’s the size of a swimming pool and is in the middle of the exhibit. 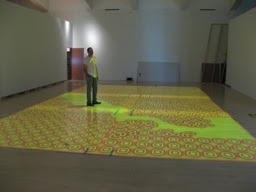 Below is Brian checking the projection out before the vinyl floor has been laid down and before Brian has tweeked it to his satisfaction. Camille Utterback is showing three works, External Measures 2003, Untitled 5 and Untitled 6. This is the first time all three works in this series have been shown together. They’re very impressive. Both Camille and her assistant, Genevieve Hoffman loved the Lift Truck. I think they both want to get one for themselves when they get back to San Francisco. Here they are talking to John McKinnon, the Assistant Curator of Modern & Contemporary Art, and the Museum point person for the show. It’s been great working with John. 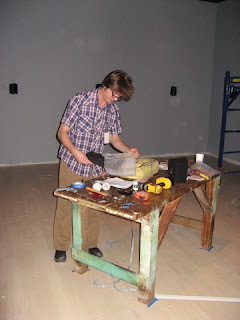 And here’s John again talking with Robyn Moody, Janet Cardiff’s installer for her interactive table, To Touch. Robyn is a genial artist himself from Calgary and we enjoyed looking for Milwaukee restaurants with him a great deal. 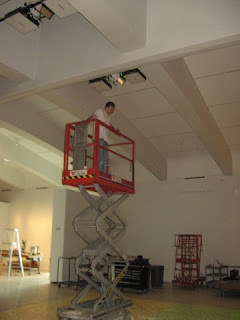 Here’s Robyn installing the work. And that isn’t just some old work table he’s laying stuff out on, that’s the artwork itself. That was the first week. Last week, Liz Phillips, Danny Rozin and Ian Budish, Scott Snibbe’s installer all came. Here’s a picture of Danny working in front of his magical Snow Mirror, that captures your reflection in digital drifts of falling snow. 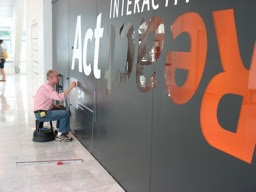 Finally here’s John Irion, Museum exhibition designer, who did such a great job organizing the space of Act React, putting the final touches on the front of the Baker/Rowland Gallery.